BOAO, China, April 12, 2018 /PRNewswire/ — “Sharing economy”is again under spotlight in Asia. During the 2018 Boao Forum for Asia (BFA), an Asian equivalence of the World Economic Forum, top entrepreneurs in the Chinese sharing economy business gathered in a panel to discuss the industry’s future. 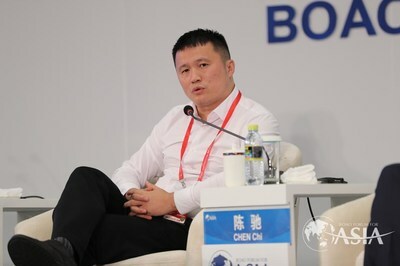 Chen Chi, co-founder and CEO of Xiaozhu.com, the country’s leading and fastest growing house sharing platform, was invited to speak in the session named “The Sharing Economy: Getting Down to Business”. According to report by China’s State Information Center, Chinese house sharing market grew by 70.6% in 2017, achieving an accelerated speed of growth. “After more than 5 years of development, house sharing has taken deep root in China, while it is also penetrating rapidly to lower tier cities and the countryside”, Chen Chi commented. On Xiaozhu’s platform, as Chen pointed out, tier 2 cities like Tianjin, Chongqing and Changsha were among the fastest expanding markets. When speaking about the profitability of sharing economy platforms in China, Chen revealed that Xiaozhu has developed a healthy and profitable business model. When asked about Airbnb’s recent active movements in China, Chen said this is an example of how foreign companies are learning from Chinese companies, in terms of localization and business innovation. Xiaozhu’s competitiveness, as Chen emphasized, lies in strong offline service capability, which imposes high requirements for the teams’ philosophy and execution. The company has devoted great effort in the construction of service system and infrastructure since the very beginning, which is different from its US competitor. Founded in 2012, Xiaozhu.com is among China’s largest house-sharing platforms. In November 2017, the company announced it had raised $120 million in its latest financing round, led by the Jack Ma-backed Yunfeng Capital.